Press freedom is a global concept that encourages the freedom of the press from external influences or interferences. In Africa, press freedom is enshrined in the constitutions of most countries. However, there are several factors and issues that limit press freedom in Africa. Using Nigeria and Uganda as examples, this chapter explores press freedom and socio-economic issues in a democratic media landscape. Furthermore, the chapter was organized in a number of rubrics; it x-rayed the concept of press freedom. It also examined the constitutional basis of press freedom in Uganda and Nigeria. The chapter concludes that Press freedom promotes transparency and flourishes more in countries where there are constitutional and legal provisions are greatly promoted because of the democratic principles and ideals which are conducted with openness. In the international community, press freedom has been a core issue discussed among media professionals and government officials in the 21st century. The issue and debate of press freedom has been prevalent due to its importance in the transparency and governance of nations across the globe. Also, the concept of press freedom is at the heart of human capital development as well as sustainable development of a nation. Basically, press freedom denotes the right of every person to own a printing press, to publish whatever information or ideas that pleases him, to decide the editorial policy of a publication and to enforce it upon his staff and to distribute freely without having to obtain license from the authorities or face suppression or proscription. 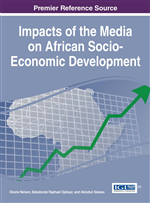 However, studies have shown that African journalists experience socio-economic issues and factors which have crippling effects on their professional practice as the ‘Fourth Estate of the Realm’(Wilcox, 1975; Okunna, 2003, Ufuophu-Biri, 2006; Okorie, 2010). Countries like Nigeria and Uganda are typical examples of African countries in term of socio-economic controls or interferences of the press activities and operation in African societies. Nevertheless, the press struggles with these socio-economic issues and factors to operate as the watchdog of the populace in making the government accountable to the citizens of the nation. This chapter seeks to examine the issues and challenges confronting the concept of free press among media professionals in the African society. Furthermore, the chapter will examine how free the press is in a liberalized media landscape, placing emphasis on Nigeria, Uganda and Namibia. Freedom of the press has been said to be a cornerstone to judge maturity of democracy in many societies. Freedom of the press is a concept that has often been explained as the freedom of the press to publish whatever information they feel is necessary for the public to know. According to Oster (2013), ‘the media is to be accepted as a legal institution with specific rights and responsibilities’. He also added that ‘the media is to be defined as ‘a natural or legal person gathering and disseminating to a mass audience information and ideas pertaining to matters of public interest on a periodical basis and according to certain standards of conduct governing the newsgathering and editorial process’. In the same vein, Sani (2014) believes that the mass media as a source of information is expected to be reliable, but in some countries, dictatorship adulterated the information emanated from media to control public opinion and ensure conformity. Press freedom is a topical issue of great relevance not only to private individuals and the media industry, but also to governments in their efforts to achieve a democratic society. A free press plays a critical role in informing electorates and serving as a check on government’s activity, as well as giving meaning to public opinion. It provides a framework for public authorities to be held accountable and as a means for citizens to freely express and exchange their views on public issues. Conceivably, freedom of the press and of expression constitute the foundation on which a democratic system is built (Hardy, 2008, p.80).